Turnouts and crossovers, including switches, frogs, guard rails, stock rails, and closure rails; rail fastening assemblies unique to turnouts; and miscellaneous components associated with turnouts, including switch rods and gauge plates. Crossover tracks, double crossovers including the central crossing frogs or diamond area, and single and double slip switches are included in this category. The cross ties to support turnouts and crossovers can also be considered part of special trackwork, especially concrete switch ties, which require far more design and fabrication effort than ordinary timber switch ties. Track crossings that permit one track to cross another at grade. Such crossings can be designed as a rigid block or can include movable center points. Points (switch rails or point blades) are the movable rails which guide the wheels towards either the straight or the diverging track. They are tapered on most switches, but on stub switches they have square ends. In ordinary conversation, it is common to use the word “switch” when referring to a “turnout,” which is technically incorrect. 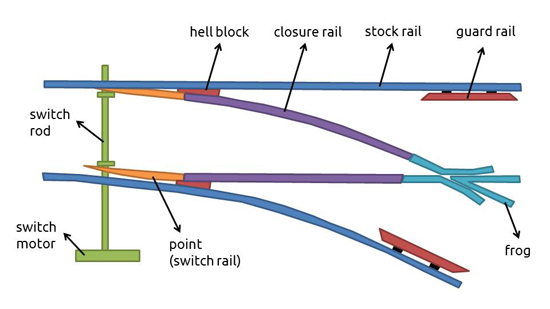 Stock rails are the running rails immediately alongside of the switch rails against which the switch rails lay when in the closed position. The stock rails are otherwise ordinary rails that are machined, drilled, and bent as required to suit the design of the turnout switch and the individual switch point rails. Closure rails are the straight or curved rails that are positioned in between the heel of switch and the toe of frog. Guard rail (check rail) is a short piece of rail placed alongside the main (stock) rail opposite the frog. These exist to ensure that the wheels follow the appropriate flangeway through the frog and that the train does not derail. Heel block assemblies are units placed at the heel of the switch that provide a splice with the contiguous closure rail and a location for the switch point rail to pivot at a fixed spread distance from the stock rail. Switch point rail stops act as spacers between the switch point rail and the stock rail. Stops laterally support the switch point from flexing laterally under a lateral wheel load and thereby possibly exposing the open end of switch point rail to head-on contact from the next wheel. A switch operating device moves switch rails. Switch rails can be thrown (moved) from one orientation to another by either a hand-operated (manual) switch stand or a mechanically or electro-mechanically (power-operated) switch machine. In both cases, the operating devices are positioned at the beginning of the turnout opposite the switch-connecting rods near the point of the switch rails. A single crossover consists of two turnouts positioned in two tracks that allow the vehicle to go from one track to another. The two tracks are usually, but not always, parallel, and the turnouts are usually identical. A pair of single crossovers—one right hand and one left hand—that are arranged sequentially along the tracks is called a universal crossover. A double crossover —sometimes called a scissors crossover—consists of two crossovers of opposite hand orientation superimposed upon each other. In addition to the four turnouts involved, a track crossing diamond is needed between the two main tracks. A double crossover is typically used only when it is necessary to be able to switch from both tracks to the other in either direction, but there is insufficient space to install a universal crossover as described above. Track crossings, as the name implies, permit two tracks to cross each other. Track crossings are often called either crossing diamonds or simply diamonds, due to their plan view shape. A single slip switch works on the same principle as a double slip but provides for only one switching possibility. Trains approaching on one of the two crossing tracks can either continue over the crossing, or switch tracks to the other line. However, trains from the other track can only continue over the crossing, and cannot switch tracks. This is normally used to allow access to sidings and improve safety by avoiding having switch blades facing the usual direction of traffic. To reach the sidings from what would be a facing direction, trains must continue over the crossing, then reverse along the curved route (usually onto the other line of a double track) and can then move forward over the crossing into the siding. A double slip switch (double slip) is a narrow-angled diagonal flat crossing of two lines combined with four pairs of points in such a way as to allow vehicles to change from one straight track to the other, as well as going straight across. A train approaching the arrangement may leave by either of the two tracks on the opposite side of the crossing. To reach the third possible exit, the train must change tracks on the slip and then reverse. Lapped turnouts can be used to achieve a more compact track layout in constrained locations. In a lapped turnout, as seen in following picture, the switch rails for a second turnout will be placed between the switch and the frog of the initial turnout. This introduces a third frog where a closure rail of the first turnout crosses a closure rail of the second turnout.